but I really appreciate the effort so far. how used the new Beta in my operation sistem Windows7? I don´t know how. can u help me? - a bug that wrongly shifted the texture applied on an object with a 3D model file not placed at the origin (see here). The correction of this last bug helped me also to find how to show a texture correctly on the front side of an object, so you don't have to turn it around to see its back face. This new behavior will be applied only to the texture changes you'll make from this version. Install Java on your computer and click on this link. If it doesn't install the current beta on your system, then please wait for the final release a few more days. I have a question about putting stairs in: When you put them in, shouldn't they punch a "hole" in the floor above, or below them like windows and doors do? But I know you'd have to be able to tell SH3D that the stairs start on floor 0 (and therefore no floor hole is needed) but for them to punch a hole in the floor above to get to the 2nd floor and if another set of stairs is placed above that, to punch a hole in the floor above that to get to the 3rd floor, etc.? I hope this is not too difficult. I thought you had an icon for adding levels. Where did that go? I hope you won't be taking that out for the final version. I have a question about putting stairs in: When you put them in, shouldn't they punch a "hole" in the floor above, or below them like windows and doors do? I just added this feature in version 3.4 Beta 32. To let you import 3D models as staircases too, I added a new Staircase checkbox at the third step of the import furniture wizard and in the upcoming update of the Furniture Library Editor. 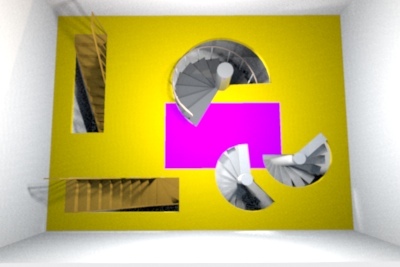 In that case, the cut out shape of the staircase will be a rectangle with the same width and depth as the object itself. To avoid presenting too much features to beginners, the button and the level tabs are displayed only once you added a first level with... the Plan > Add level menu item. I made a balcony with a floor but when you "walk" under it, you can see right through the floor like it isn't even there. This behavior happens because you didn't create a ceiling at the lower level matching the bottom of the balcony, and OpenGL faces are visible only from one side. As I'm afraid of a flow of FAQs about this, I'm probably going to improve this behavior before releasing version 3.4. The idea would be to always create the opposite (ceiling) part of upper level floors, except at the places where the user drew a ceiling at the lower level. This is not so easy because it requires to compute some intersections between the user ceilings and these opposite parts, otherwise the superimposed surfaces won't be rendered correctly. I had a quick look at it, and it looks perfect. Right now, I don't have the time to thoroughly test it, hopefully that will come in the next few days. Great improvement, congratulations, Emmanuel, though when I downloaded the new version, I wish it was an update for the zoom problem in bird view mode ! Next time may be ? I updated the beta version to generate automatically the bottom part of a floor at upper levels, when no ceiling part was drawn at the lower level. It contains also a few bug fixes reported by a nice team of Swedish students who test Sweet Home 3D at this time. Nice job guys! Sorry I don't think I will change bird view mode anytime soon, except for this case. It works great! I'm so happy with that. Great job Emmanuel!